Abstract and full paper submission are closed! Research scholars and students are invited to present their original work in any of the symposium sub-themes. The list of the symposium sub-themes is not exhaustive and, therefore, authors should not feel limited by them. All abstracts should be submitted before the 1st of May, 2016. Authors can submit their original work in the form of an ABSTRACT, free of charge. An author may submit only one abstract as the first author. After undergoing the reviewing process, all authors will be notified about the condition of their submission (accepted or rejected) by the 15th of April 2016. Presenters must be registered and have paid registration fees for the symposium by the 15th of July, 2016 at the latest to secure their oral or poster presentation during the symposium and the publication in the electronic Book of Abstracts. Abstracts may be submitted for oral or e-poster presentations. The scientific and the organising committees reserve the right to decide the final presentation format of any submission. Abstracts must be submitted online by filling in the Registration and Abstract Submission Form. Abstracts must be allocated to a specific sub-theme of the Symposium. Abstract title is limited to 200 characters including spaces and should be typed in UPPER CASE letters. Abstracts should not exceed 350 words (excluding references) and may not contain any tables or graphs. Abstracts must be informative and structured, with section headings, as follows: Background, Methods, Results and Conclusions. References in the text have to be cited at the end of the abstract (3-4 references). Provide 3-5 keywords or phrases that reflect the content of the abstract. All accepted abstracts will be published in the electronic Book of Abstracts with an ISBN number, under the condition that the first author has paid registration fee by the 15th of July 2016. Full-length manuscripts may be submitted for publishing in the Baltic Journal of Sport and Health Sciences (BJSHS) (see the section “Call for Full Papers” below). Accepted authors are expected to use PowerPoint slides. Text should be large so as to be visible from the back of the room when projected. Oral presentations must be in English. The time allocated for an oral presentation time is 10 minute followed by 5 minutes of discussion. Accepted authors should prepare their e-poster presentations in Power Point format (one single slide only) in landscape (horizontal) (see the e-Poster Sample). The image files need to be inserted into the poster by using the PowerPoint “Insert” function. No animated effects, animations or videos. e-Poster presentations must be in English. The time allocated for an e-poster presentation is about 5 minutes, including questions and answers. To ensure the smooth running of the poster session, the symposium organisers request the presenters to upload their e-poster presentations in advance at least 24 hours before to the beginning of the poster session. Presenters are expected to introduce themselves to the session chair at least 10 minutes before the beginning of the poster session. 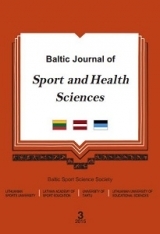 Selected papers will be published in the Baltic Journal of Sport and Health Sciences (BJSHS), an international peer-reviewed scientific journal, indexed in Central and Eastern European Academic Source (EBSCO), IndexCopernicus, SPORTDiscus with Full Text (EBSCO). Full manuscripts should be submitted for consideration of publication by the 1st of May, 2016 and prepared according to the BJSHSguidelines for authors. Papers that do not correspond to the journal requirements will be not published. Sporto 6, LT-44221 Kaunas, Lithuania. Company code 111951530, VAT code LT119515314.